Hej, Budget Magic lovers, it's that time once again! This week, we are heading to the super-sweet Dominaria Standard format to play a couple of the most unique cards from Magic's newest set—Valduk, Keeper of the Flame and Champion of the Flame—in a deck I'm calling UR Auras! The deck itself is sort of similar to some of the all-in Kiln Fiend decks we've played in Modern, looking to go all-in on one creature and kill the opponent as quickly as possible, while also somewhat like the dreaded Bogles, since we're loading up our creatures with a bunch of auras. The end result is a deck that's extremely explosive and fun, sometimes killing opponents as early as Turn 4! Can Valduk, Keeper of the Flame and Champion of the Flame compete in Dominaria Standard? Let's get to the videos and find out; then, we'll talk more about the deck! The basic idea of UR Auras is simple. We find a Champion of the Flame or Valduk, Keeper of the Flame. We protect our Champion of the Flame or Valduk, Keeper of the Flame. We load our up our Champion or Valduk with a bunch of auras and hopefully kill our opponent before they draw enough removal spells to kill our Champion or Valduk. The end result is a sort of hybrid aggro-combo deck that walks the line between an all-in Kiln Fiend deck and a less resilient version of Modern Bogles! One of the interesting aspects of UR Auras is that we don't really have that many creatures to put our auras on, with only Champion of the Flame and Valduk, Keeper of the Flame really facilitating our plan. As a result, we really need at least one of these creatures in our hand, so much like Modern Bogles, if we don't have a creature, we typically have to mulligan to find one or else risk losing by having a handful of auras and protection but no creatures to enchant or protect. Champion of the Flame is our most aggressive creature. When we play it on Turn 2, it's very possible that we can enchant it with two auras on Turn 3, making it into a 7/7 or 8/8, depending on the auras, which means that we typically have lethal if we can play a couple more auras on Turn 4. Trample is also pretty helpful. While some of our auras give our creatures flying along with a power and toughness boost, having a source of evasion is important to making sure our opponent can't simply chump block us out of the game. The end result is that Champion of the Flame is very good at going tall, giving us one massive threat to close out the game. 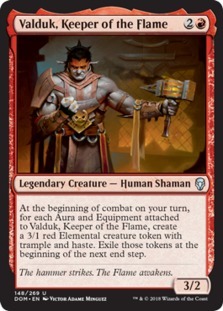 Valduk, Keeper of the Flame is almost the opposite of Champion of the Flame—rather than going tall, it helps us go wide by making a bunch of 3/1, hasty, tramping Elemental tokens each turn. This means with just one aura on Valduk, we have at least seven power of attackers each turn, and once we get three or four auras built up on the Shaman, Valduk, Keeper of the Flame can win the game all by itself with the horde of Elemental tokens. While which of our creatures is better depends mostly on the matchup and situation, together they help to make sure we always have at least one creature that cares about auras so we can start dumping our hand and attempt to win the game before our opponent draws too many removal spells. Riddleform is only a two-of in our deck because it's high variance. It can be pretty bad if we don't have another creature, since we can't really put auras on the enchantment (even if we manage to turn it into a creature, they will fall off at the end of our turn when Riddleform turns back into an enchantment). 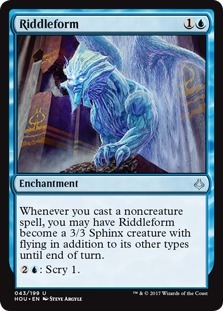 On the other hand, Riddleform is a great second creature, since it consistently turns into a creature while we are casting our auras and hits for an extra three in the air every turn. Plus, when everything goes wrong, the ability to scry away dead cards to dig for more creatures and auras is a nice bonus. Our auras basically break down into two groups: card-draw auras and power-boosting auras. This is a bit deceptive because all of our auras are technically power boosters, since they are going on Valduk, Keeper of the Flame and Champion of the Flame. 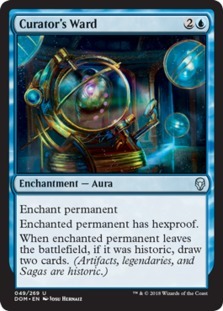 As such, our best auras not only pump our creatures but also draw us a card to keep us churning through our deck to find more auras, protection, and creatures. 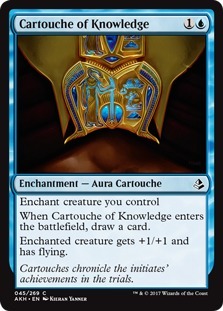 Cartouche of Knowledge is the best aura in our deck, since it not only draws us a card when it enters the battlefield but also gives the creature it enchants flying. 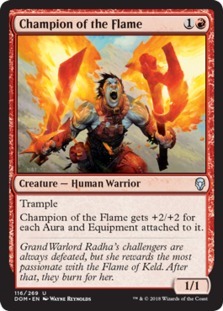 While Champion of the Flame can get by without flying thanks to trample, Valduk, Keeper of the Flame really needs flying to be able to attack on most boards. With just a single Cartouche of Knowledge, Champion of the Flame ends up a 4/4 flying trampler, while Valduk hits for four in the air and also brings along a 3/1 Elemental each turn. Meanwhile, Curious Obsession is our best card-advantage aura, since it can draw us an extra card every single turn. Plus, it's only one mana, which helps us cast multiple auras in the same turn, starting as early as Turn 3, to get in as much damage as possible, as quickly as possible. Rounding out our auras package are two copies of One With the Wind and two Arcane Flight. 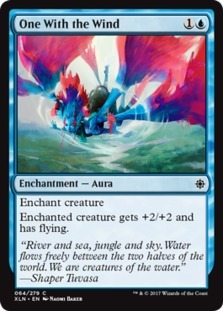 While worse than our card-draw auras, both offer flying, which is pretty helpful in allowing our creatures to attack through opposing creatures. Plus, because of how Valduk and Keeper work, we really just need a critical mass of auras because both creatures are extremely lacking before they are enchanted. Hopefully, these cards can be replaced with another card-draw aura sooner or later, but right now, Cartouche of Knowledge and Curious Obsession are the only playable options in our colors. 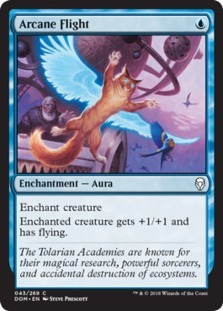 But keep an eye out during Magic 2019 spoiler season: any random, cheap card-drawing aura would be an improvement for the deck. Until then, One With the Wind and Arcane Flight get the job done. 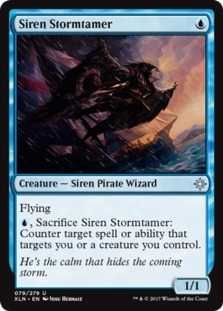 Technically, Siren Stormtamer is a creature, but it's really more of a counterspell in our deck that occasionally hits for a point of damage or wears a Curious Obsession when we are desperate. The upside of Siren Stormtamer is that it fits nicely on curve (since our other creatures are two or three mana), and once it's on the battlefield, it protects our Champion of the Flame and Valduk, Keeper of the Flame from pretty much everything, including cards like Settle the Wreckage that dodge some of our other protection spells. 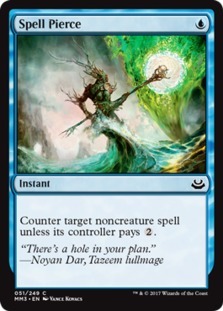 While the primary plan of our deck is to put our auras onto Keeper and Valduk, the fact that Siren Stormtamer is a creature means that we can throw auras on it when everything goes wrong, although this is pretty much our plan Z (like when Modern Bogles starts putting auras on Dryad Arbor or Infect starts throwing pump spells at Noble Hierarch—it's usually a pretty clear sign that something went wrong, but it's nice to have the option available if there's no other choice). Otherwise, when it comes to protecting our creatures, we have Dive Down and Spell Pierce. There isn't really much to say about these cards specifically. 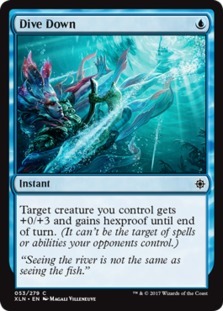 Dive Down fizzles targeted removal like Seal Away and Fatal Push, while Spell Pierce handles pretty much everything in the early game and has some additional utility in countering Vehicles and planeswalkers, but it loses value pretty quickly if the game goes long and the opponent makes their land drops. As such, rather than talking about these spells specifically, let's take a minute to talk about the importance of protecting our creatures. One of the most common ways that UR Auras loses is by not finding a creature or by finding one creature, having it die to a removal spell, and not finding a second creature. Because we only have four copies of Valduk, Keeper of the Flame and four Champion of the Flame, running out of creatures is a real issue. Because of this, we often have to do a strange dance where we try to figure out if we should cast a Champion of the Flame on Turn 2 so we can start attacking or wait until Turn 3 and leave up protection. The answer mostly depends on the situation, but the bottom line is that protection is important. If you just run out Valduk and Keeper unprotected every single game, things can very easily go wrong, and the deck will feel horrible. In UR Auras, our creatures are very valuable because they are few and far between. Of course, the good news is that we only really need a single creature to win the game. If we can play a Champion of the Flame; protect it from removal with our Siren Stormtamer, Dive Down, and Spell Pierce for just one mana each turn; and have enough mana to start loading it up with auras as well, then it typically only takes a couple of turns to win the game. So we don't need to protect our creatures forever—just a turn or two should do in most games. Since UR Auras is pretty close to a combo deck, we don't really have too many slots left over for utility cards, but we do manage to sneak in four copies of Abrade so we have at least a little bit of removal. Abrade is the perfect option in a deck that only has four slots for removal, since it not only hits early-game creatures but can also take down annoying artifacts like Heart of Kiran and Aethersphere Harvester. Otherwise, instead of removal, we mostly just plan on killing our opponent quickly enough that we don't need hard removal. First, as far as our record, we finished our video matches 3-2, although we actually ran into Red Aggro and UW Control a second time and lost, dropping our overall record to a not-that-exciting 3-4. 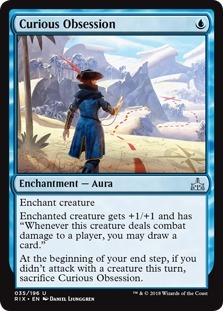 As such, it's hard to recommend UR Auras as one of the most competitive budget decks in Dominaria Standard. Thankfully, what UR Auras lacks in terms of level of competition, it makes up for in explosive sweetness. While you might not win a tournament with the deck, you'll win some games, and you'll win those games with style! As far as improvements to make to the budget version of the deck, I'm not sure there's really a whole lot to be done. The deck is missing about one Bogles-ish creature and one more card-draw enchantment, but without splashing into another color (which would up the budget considerably), there isn't a whole lot we can do to fix this other than wait for Magic 2019 to bring some more cards to the format. While the deck is certainly fun and playable as is, having a bit more redundancy to increase its consistency would be helpful. This being said, one card worth experimenting with is Curator's Ward. I found the aura to be hard to protect because it's fairly expensive, but it does offer a good form of protection if we manage to get it onto a creature. All in all, UR Bogles is super fun but suffers from a lack of consistency because we're a bit light on creatures that care about auras. While the good games are really good, the bad games are pretty bad. Considering that the deck is already somewhat inconsistent, maybe the best option is to play the ultra-budget build of the deck. While technically the deck costs $76, this number is actually a bit deceptive, since Spirebluff Canal and Sulfur Falls make up about $55 of that price tag. If you simply cut the rare lands and replace them with more basics, the deck will only set you back $20 (and you might already have most of what you need if you opened a booster box of Dominaria). While these changes would make the deck even less consistent, you'll have just as much fun in the good games where you kill the opponent on Turn 4 or 5 with a huge Champion of the Flame or Valduk, Keeper of the Flame! For our non-budget list this week, we branch out from straight blue-red into Jeskai to solve some of the problems with the budget build of the deck. While going into Jeskai more than doubles the budget—mostly for a bunch of rare lands to make the mana work—it adds a ton of consistency. First, we get a bunch more creatures, with Adanto Vanguard being the closest thing we have to a real Bogle thanks to its ability to gain indestructible, Danitha Capashen, Paragon providing another huge threat that also reduces the cost on our auras, and Sram, Senior Edificer turning all of our auras into card draw and helping make sure we don't run out of gas. With these changes, we can afford to cut back a bit on protection because rather than really, really needing one of our eight creatures to live, we can simply draw another one if our opponent finds removal. Apart from the creatures, these changes also allow us to play a couple of different auras, with On Serra's Wings being a great one-of, as the lifelink gives us a way to build our own Lyra Dawnbringer; Saving Grace being a cute way of protecting our team (and ourselves) from damage, especially with Adanto Vanguard, which can soak up all of the damage and survive; and Curator's Ward. Curator's Ward was risky in the budget list, but the combination of Sram, Senior Edificer making it cantrip when we cast it and Danitha making it cheaper means that it's a very legitimate option for protecting our creatures in the non-budget build. The end result is that Jeskai Auras is much less all-in that the budget build but is also much better suited at playing the long game and fighting through the opponent's disruption. Hopefully, we get a chance to stream it at some point because it actually looks pretty powerful! Anyway, that's all for today. As always, leave your thoughts, ideas, opinions, and suggestions in the comments and you can reach me on Twitter @SaffronOlive or at SaffronOlive@MTGGoldfish.com.